Helen’s Hair Studio has found a unique way to make customers beat a path to the front door. 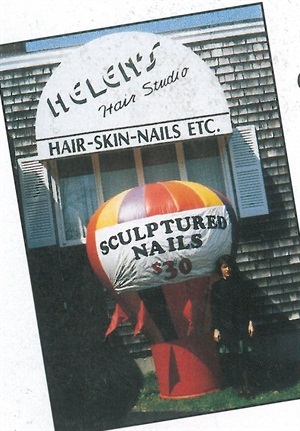 Helen’s Hair Studio in Raynham, Mass., has found a unique way to make customers beat a path to the front door---a cold air balloon. “We place an ad or a message on the front panel of the balloon, plug it in, and in five minutes we’re attracting business,” says Aaron Tobey Jr., Helen’s business manager. Since the salon started using the balloon, walk-in business has increased more than 100%, going from 20 to 45 walk-in clients per month. Unlike traditional advertising that you pay for monthly, the balloon continues to bring in business long after it’s paid for. The salon purchased the 8 ½ -foot-tall balloon directly from the manufacturer, saving approximately $400 off the retail price. Advertising panels range from $40 to $120, depending on the message.